A concrete driveway does it all. Concrete is an excellent driveway material. It is versatile, preferred for durability, appearance and low maintenance. Concrete is functional and lends itself to a wide variety of design options. Concrete can have the decorative appearance, feel, and color of brick, tile, slate, or stone. 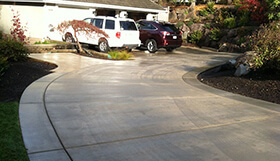 Concrete driveways can last up to 30 years or more without major maintenance. The key is to have it done right in the beginning. Good planning, site preparation and quality concrete installation is essential. Afterward, the curing, jointing and sealing will give you a beautiful and functional addition to your home, that will likely increase its value. Design versatility with color, texture, scoring and stamping. Professional installation may increase the value of your home. Certain amount of maintence required. Cracks or stains may require repairs.